Malt-flavored soft drinks are popular in Latin America, where they go by the name Malta. The drink originated in Germany, where it was called malzbier. In that early version, the beverage was fermented to less than 2% ABV, then bottled and pasteurized, leaving considerable residual sugar. Modern commercial versions use corn syrup, malt extract and artificial carbonation. This recipe calls for an all-malt approach with no fermentation, and adds a bit of herb tea to expand the flavor sensation. Easy to make, it is prepared as fully non-alcoholic syrup, and carbonated with club soda. The recipe is inexact with regard to herbs, so experiment with proportions to suit your taste. 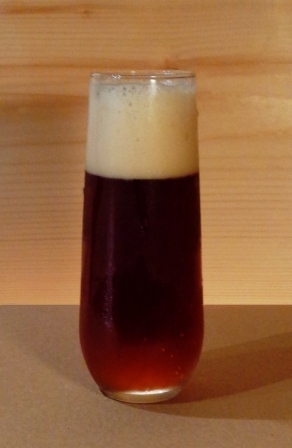 The accompanying photo shows a malta made with two grams of whole Fuggle hops for every four liters of beverage. They have not been boiled with the malt, and so the flavor and aroma are prominent, but the bitterness is quite mild. The sweetness is there, but is subtly balanced by the hop addition. To create a drink with even more complex flavor, with considerably more effort you can try an all-grain version. Mash base and specialty grains as you would for beer, collecting about 1.5 liters of liquid. Heat water to 70 C, add cracked caramel malts in grain bag, steep 30 minutes and remove. Drain liquid from grains and add water to bring back to 1.2 L. Heat water to 100 C, remove from heat. Stir in malt extract and herbs. Cool one hour. Dispense 150 ml into each of eight 500 ml swing-top bottles. Freeze syrup in bottles, top up with soda water, store in refrigerator. When the frozen syrup has thawed, gently agitate the bottles to suspend the ingredients. After 24 hours any grain flour or trub will again sink to the bottom, leaving the flavor and color components suspended. The liquid can be decanted off the sediment to serve a more clear drink. This entry was posted in soft drinks and tagged ale, barley malt, beer, crystal malt, fermentation, homebrewing, malta recipe, soft drink, soft drink recipe, umami.